This is not a true garlic -- botanically it is closer to leeks than to garlic -- yet it produces huge bulbs, sometimes exceeding one pound each. 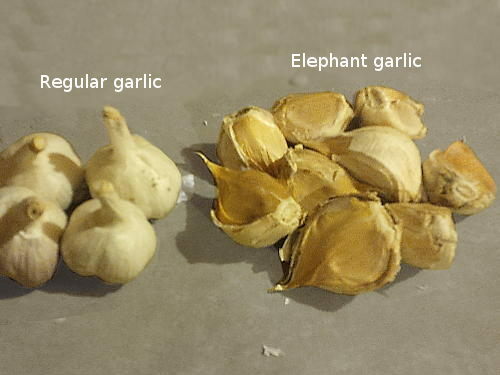 Single cloves can be as big as entire bulbs of true garlics, as can be seen in the photo. Flavour is sweeter and much milder than regular garlic. Can be steamed as a vegetable dish with cream sauce, or sliced raw into salads. Large cloves are much simpler to peel and prepare than regular garlic. There are 4-6 cloves per bulb.